A 12-year-old Escondido boy was killed in a minivan crash Sunday in Utah, the Utah Highway Patrol reported. The crash happened around 7 p.m. on the southbound Interstate 15 in Fillmore, Utah, the agency said. 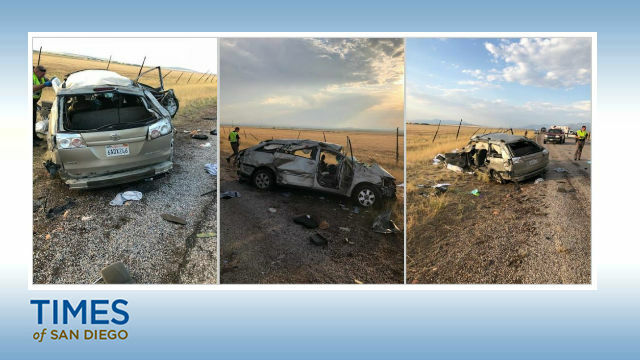 A 16-year-old teenage girl was driving the van with a learner’s permit with her father in the passenger seat when she steered sharply to the right, causing the van to begin to slide to its side, the UHP said. The van crossed several lanes of traffic, ended up on the embankment, rolled several times, crossing the right-of-way fence and coming to a stop on a frontage road, according to the UHP. Two boys, ages 12 and 14, were ejected from the vehicle. The 12-year-old, later identified as Alex Speer, was killed, the UHP said. The teenage driver and her 48-year-old father, Barry Speer, was flown to Utah Valley Hospital. Six people in the van were seriously injured except for a 9-year-old boy, who sustained minor injuries, the UHP said. They were taken to Fillmore Hospital, the agency said. Barry Speer serves on the Escondido’s Advisory and Appeals board.